Friendship - it's a tricky sort of relationship. One that changes as you get older and seems to become even more complicated. I'm always trying to teach my girls the importance of having friends, that doesn't mean being popular with everyone, but having someone close who you know you can always lean on when necessary. Once there was a tree that grew little girls . . .
Four girls meet under an apple and sow the seeds of a bond that will last a lifetime. Follow their friendship as the years pass by and the girls become women. I read The Girls really quickly. What I liked about the book was that it tells you that you always have someone with you wherever you are, you're not alone. At the end of the book the girls grow older so if there was going to be a second book I'd like to see what their friendship is like as women instead of girls or it could be a story about their own kids. My favourite bit in the book was when it told us what they became when they'd grown up. 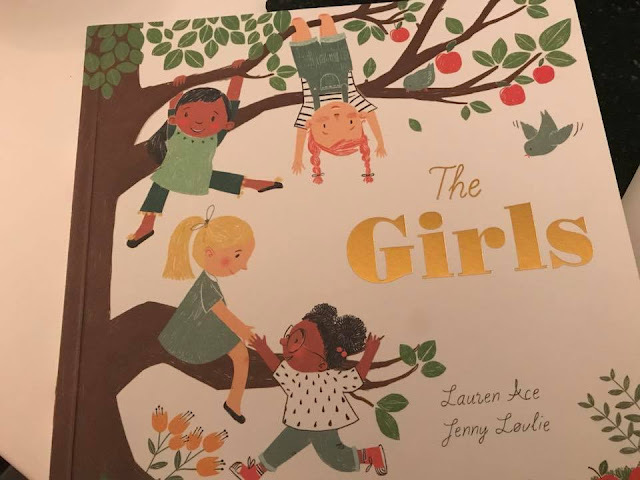 The Girls is a lovely story and I'd really like to see another version of this book for older children with more words. Now the age demographic for this book is actually three to six year olds so it was interesting to see just how well it resonated with my eight year old. It's a really sweet story with plenty of meaning behind it. At the beginning we are introduced to the girls: Sasha, Lottie, Alice and Leela. What is made clear from the beginning is that not one of those children are the same. They are all wonderfully unique, not only in looks but also their personalities and interests too. 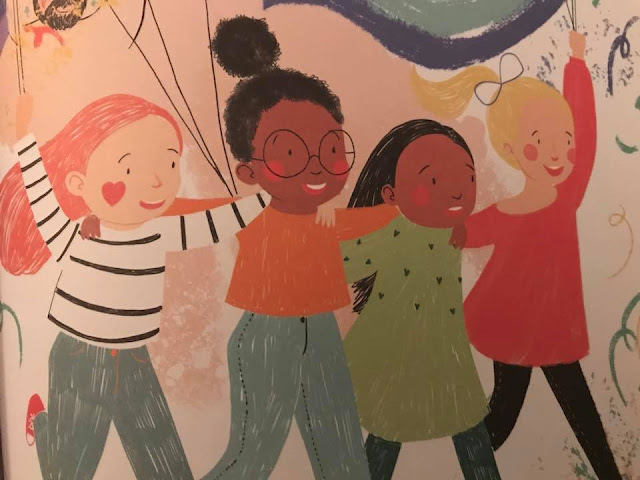 What the book manages to show little ones is that friendships can be formed with anyone. Lessons are learned by these independent, little girls as their relationships is strengthened. We learn that even when we argue, it doesn't mean that you can't be friends. It's grasping the importance of sharing. How you react if a certain situation has occurred. Knowing it's ok to be feel hurt or angry. 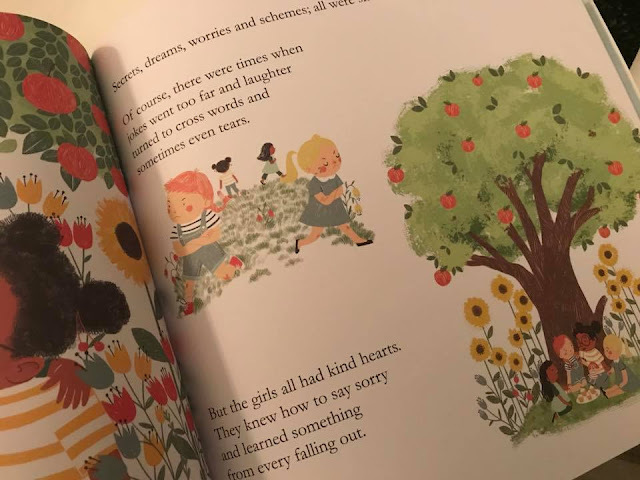 As the girls grow in age and in mind, the author keeps referring back to apple tree that they first met under. Making clever references to the fact that their friendship is just like the roots of that grand, old tree. Growing stronger and deeper with each passing year. For what appears to be quite a simple story, The Girls is actually extremely thought provoking. I could see it becoming a brilliant resource in schools when trying to discuss the subject of friendship. With each turn of a page we are taken on a journey along with the girls. Through ups and downs, laughter and tears. It is an poignant, inspiring and powerful book. Along with adorably, charming illustrations, as the reader you find yourself eager to know just where the girls are headed in their lives. As an adult I feel that friends are just important as family. And the best ones are the ones you can call on out of the blue even when you haven't spoke to them in months. The girls depicts this concept perfectly. Through the good times and the bad, friends stick together. An utterly charming book. This sounds lovely! I find that even my eldest makes far too many judgements of people based on appearance and forgets that friends can be quite different! This book looks and sounds lovely. My girls are going through some friend issues at the moment. I'd forgotten what it was like to be a teenage girl in secondry school with all the ups and downs that friends bring. I'm glad I'm not back there, that's all I'll say!